Successfully Added EZpad 4S Pro Windows Tablet PC - Licensed Windows 10, Intel Cherry Trail CPU, 4GB RAM, 10.6-Inch Display, 1080p, Bluetooth, WiFi to your Shopping Cart. If you’re looking for an affordable yet high-end Windows Tablet PC, the EZpad 4S pro is perfect for you. This sleek tablet computer runs on a Windows 10 operating system. Thanks to this, it treats you to all the trusted Windows and MS Office features that can now be enjoyed anywhere you go. It comes with sophisticated hardware, meaning it can be used for study, entertainment, and business purposes alike. Whether you simply wish to make some notes, play games, or browse the web – this Windows 10 tablet is sure to meet your demands. This cheap tablet comes with a beautiful 10.6-Inch display. On this screen, it treats you to crisp 1080p resolutions. For those of you who wish to enjoy your tablet’s features on an even larger screen, this Windows tablet comes with a Mini HDMI port. Thanks to this, you’ll be able to easily hook up your gizmo to your big screen TV. To further increase your user experience, your tablet PC supports Bluetooth 4.2, WiFi, and OTG. It even comes with an HD camera that lets you engage in smooth video calls with friends and family. An Intel Cherry Trail X5-Z8350 processor along with 4GB RAM deliver enough power to tackle the latest Windows features. 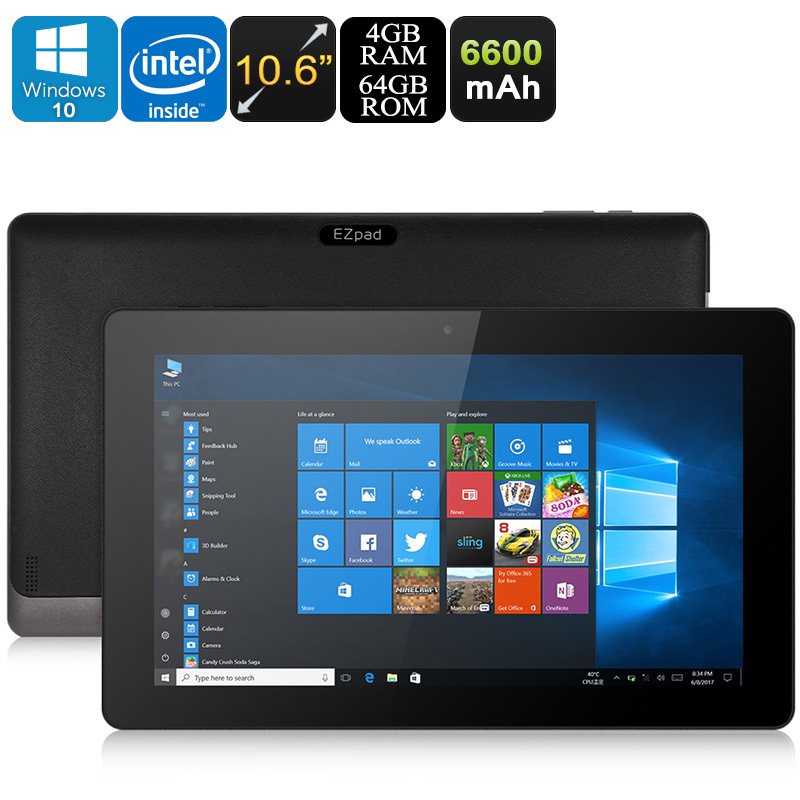 Your Windows Tablet PC comes with 64GB ROM and 128GB external memory support. With this, the EZpad 4S pro treats you to all the storage you need for your files and media. Thanks to a powerful 6600mAh battery, you’ll be able to enjoy all the latest and trusted Windows features on the go for up to 6 hours straight. This will get you through a day at the university or office without needing to worry about battery life. The EZpad 4S Pro Windows Tablet comes with a 12 months warranty, brought to you by the leader in electronic devices as well as wholesale tablets..